Gangadhara Tilak Katnam is a retired civil servant who uses his pension fund to repair potholes in the southern Indian city of Hyderabad. The BBC's Geeta Pandey spends a day with the man christened the "doctor of roads". It's only 8am but the merciless hot summer sun is scorching. Mr Katnam puts out red flags to cordon off a part of the road and, assisted by a group of 16-year-old students, begins work on three small potholes in the middle of the road. Orange gloves are donned, broomsticks are used to sweep away the dirt, a shovel is used to remove the debris, a knife is used to tear open bags of tar and a pounder is used to level it once it's been poured into the potholes. This is the 12th article in a BBC series Unsung Indians, profiling people who are working to improve the lives of others. Someone had taken a photo of the spot and sent it to Mr Katnam a day earlier after a little girl was injured there when her mother's scooter fell in the pothole and tumbled over. "Every abandoned shoe tells a story," he says, pointing to a discarded slipper on the side of the road. "The child was injured and some passers-by took them in their car to the hospital. Because time was crucial to save the little girl's life, they didn't stop to pick up her slipper." Mr Katnam says that each day in Hyderabad, several people are killed or maimed in totally avoidable road accidents. "Potholes also cause invisible injuries like leg and back pain." An engineer with the Indian railways for 35 years, Mr Katnam retired in October 2008. A year later, he was hired by a software firm on a monthly salary of 70,000 rupees ($1,054; £740). His obsession with fixing potholes began in January 2010. "I was driving to work one morning when I came across a pothole filled with muddy water. As my car wheel went into it, the muddy water splashed some children who were walking to school with their parents. I felt horrible," he says. Most people would have soon forgotten about it, but Mr Katnam hired two labourers, bought six trucks of road fixing material and filled the pothole. Over the next two days, he went around the city fixing more than 60 potholes. The next time he passed the children and their parents on their school run, they recognised him and stopped his car to thank him. In the days that followed, Mr Katnam says, he witnessed two accidents caused by potholes. "A biker was hit by a car when he swerved to avoid a pothole. In another accident I saw, an auto-rickshaw driver was killed. "I went to the police, I wanted them to record in their complaint that these deaths were caused due to potholes, but they did not take any action." His complaints to the municipal authorities to fix the gaping holes in the roads also did not elicit any response. He would drive around the city, picking up discarded material from old roads that civic workers would dump on to the pavements. He would fill it into sacks, carry it around in his car and use it to fill potholes around the city. He also spent his own money to buy any additional material he required. "As people started telling me that I was doing a good job, I got hooked," he says. 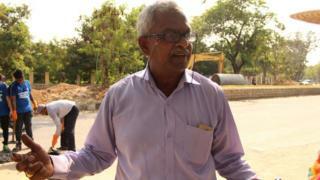 In 2011, Mr Katnam quit his job and took to fixing potholes full-time. But with no salary coming in and most of his 23,000 rupee monthly pension being spent on potholes, his finances began depleting fast. Moreover, his work meant he had to be outdoors in the sun for hours and his wife worried that he would get a heat stroke. "In June 2012, she called our son, a software engineer in the US, to come and help drill some sense into my head." His son, he says, was "very reluctant" for him to carry on with his work and they had "massive arguments". "And then a miracle happened. While my son and I were in the midst of a heated argument, a biker fell down in front of our eyes because of a pothole. That's when my son realised the value of my work, changed his mind and decided to help me." He set up a Facebook page about his father's work and that brought him some recognition. It also prompted civic authorities to start supplying road repair material to him free of cost and in the last six years, he says, he has filled 1,244 potholes. "When I started fixing potholes, people though I was a very stingy contractor who worked on his own," he laughs. But as word spread, many people have come forward to volunteer and help. His Facebook page is full of appreciative posts and last year, Bollywood superstar Amitabh Bachchan felicitated him. While I watch him at work, a jogger stops by to tell him how wonderful his work is, and Mr Katnam tells him to spread the message: "If an old man can do it, so can you." He is bitter that no state politician has taken up his suggestion to fix potholes and says that it will not just save lives, but also save authorities hundreds of millions of rupees in medical costs. And he offers a simple solution to ensuring smooth roads - traffic police can take photos of potholes and send them to civic authorities who can then fix them. In the last year, health issues have forced him to scale down and he now works two to three times a week. I ask him how long he intends to carry on fixing potholes?